Thanks to the new iBooks app in OS X Mavericks, it’s easy to store and read your ebooks—be they purchased from the iBookstore or elsewhere (as long as they’re in the .epub or .ibooks format). But you can also keep PDFs in iBooks, too, and even organize them to your liking—though Apple’s tools still leave a bit to be desired on that front. Adding PDFs to the iBooks app is easy. Just drag and drop them onto the iBooks screen, or go to File > Add to Library (Shift-Command-O) and select the applicable file. If you want to add a whole bunch of PDFs, or you’re looking for PDFs from your hard drive to add, you can do a quick Finder search to find them. To get all PDFs on your hard drive, open a Finder window, then type Kind:PDF in the search bar. The option Kinds - PDF Document should appear below the search bar. Click it, and you’ll see all PDF files on your hard drive; from there you can drag and drop to your liking. Unlike the old iBooks section in iTunes, the iBooks app doesn’t let you adjust or alter metadata for books you’ve added yourself—so if your PDF has a weird name and author, you may have to adjust that in a different program (like Adobe Acrobat) before uploading to iBooks. In addition, when you add a book to your iBooks library, it doesn’t transfer the PDF—it makes a copy. As such, you may end up with two different copies of your PDFs if you decide to add a bunch of them. 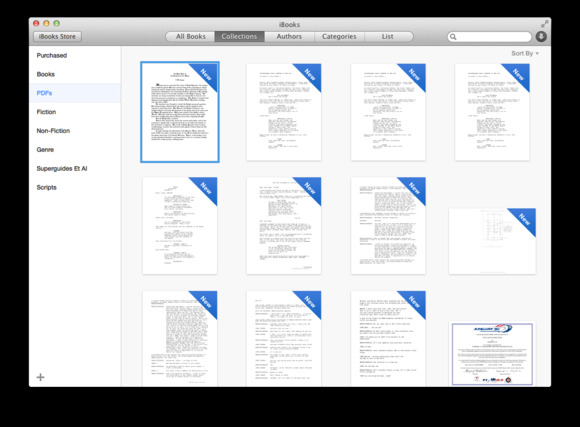 Once you’ve added your PDFs to iBooks, you can easily view and organize them by visiting the Collections tab. Click on PDFs to view all your files. From here, you can press the plus-sign button (+) in the lower left corner of the screen to add a new collection. You can create a collection called Scripts to hold all your play-based PDFs, for instance. Unfortunately, while collections sync across devices, PDFs and ePubs not purchased from the iTunes Store won’t sync—meaning that your PDF library is stuck on whichever computer you choose to organize it on. 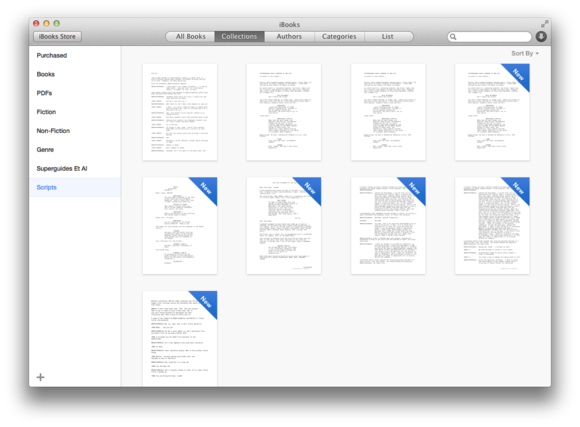 Organize your PDFs into collections in iBooks. Just like with ebooks, you double-click a PDF to open it. Interestingly enough, iBooks doesn’t actually open PDFs stored in the app—it punts them over to Preview for any viewing. Should you choose to annotate those documents, you’ll have to make a separate copy and re-upload that to your iBooks library. In short: iBooks is not a bad way to keep track of your scripts and other PDF documents, but it starts to stutter if you’d like to sync those PDFs with other devices or annotate them in Preview. With luck, we may see changes to iBooks in the future that address these issues, but for now, it’s a passable option if you’d like to group your books and PDFs locally on your computer.